Are air conditioning fees for renters the new normal? 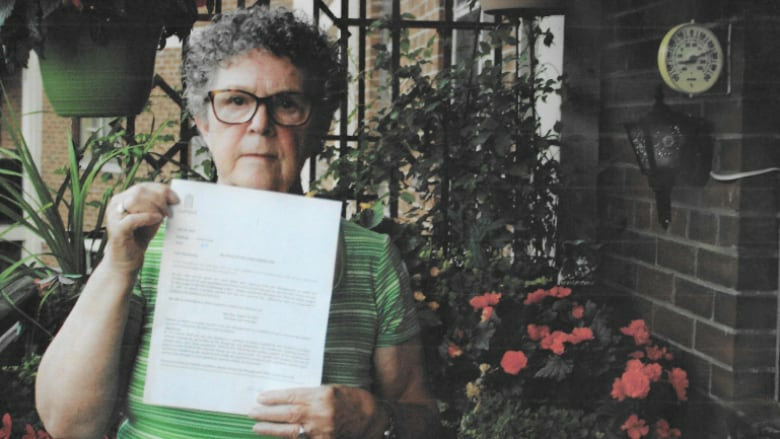 Patricia Steward, 76, received a "threatening" letter from her landlord requesting that she pay $150 for an air conditioner she's had for three decades — and if she doesn't pay, then to remove it entirely. According to one tenants' rights advocate, Steward isn't alone. Patricia Steward has lived in her East York apartment for 49 years. She's never had to pay extra to her landlord for the right to use her air conditioner, perched in her window for almost three decades. So it was a shock when she found a letter from her new landlord demanding that she fork over $150 — or remove her unit immediately. "I've had an air conditioner for at least 25 or 30 years living here," she said. "That's what confused me. Why were they asking when I'd had permission from a prior owner to put it in?" An indignant Steward says she went straight to the management office to explain that the letter didn't apply to her, but was met with assurance from management that it did. Steward took issue with the fee, but also with the language of the letter itself. "It's done in a very threatening way. I'm 76 and we have an awful lot of senior citizens in here who would be intimidated by such a letter." Geordie Dent, executive director of the Federation of Metro Tenants' Associations, isn't surprised to hear Steward's story. "This is something we deal with every year," said Dent. "There are literally tens of thousands of tenants getting these notices this summer, and a lot of them are going to be illegal." Dent suggested the fees have a serious impact on tenants. "In our opinion, it's one of the great illegal wealth transfers that happen in the city every year, from people who don't make a lot of money to millionaires and billionaires that are gouging them for illegal fees." Dent clarifies that sometimes, landlords do have the right to ask. For instance, a landlord can charge a new tenant for extra electricity with a formula they use to estimate the added hydro costs of air conditioning. "Those charges are allowed, and people are going to have to pay them if they've agreed to pay them in their lease," Dent said. But Dent says he often sees generic, sometimes sternly-written letters sent to entire buildings of tenants who had electricity included in their rent previously. "The principle of the law is this: no one can unilaterally change a contract. If you've had air conditioning for free for years, a landlord cannot, all of a sudden, introduce a charge." If a landlord comes to you to change the lease and add air conditioning fees, then legally, "You can say no," said Dent. 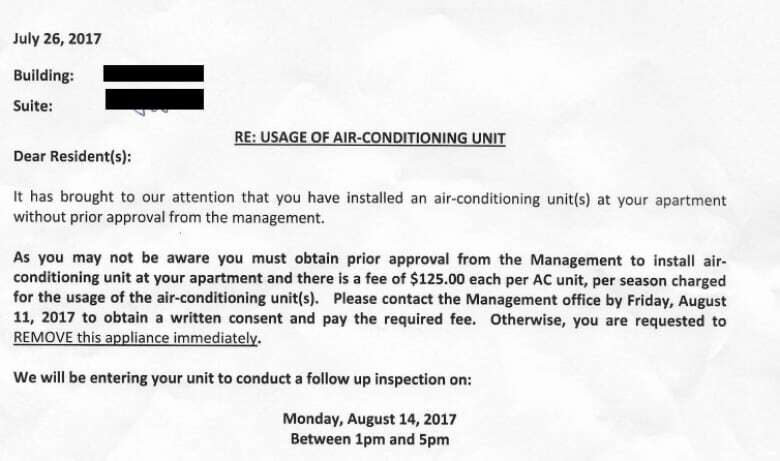 Jim Murphy, president of the Federation of Rental-housing Providers of Ontario — which represents owners of apartments like the one Steward lives in — said the air conditioning fee is just a way for landlords to recoup the growing costs of hydro. "We're swallowing it with a one-and-a-half per cent increase," Murphy said, referring to the cap on yearly rent hikes. Water has gone up too, he says. "None of those costs can be passed along. If you continue doing this for years, you're going to get to a point where it's totally uneconomical." But where Murphy sees an industry dealing with a "tremendous tightening," Dent says he sees a social justice and public health issue. 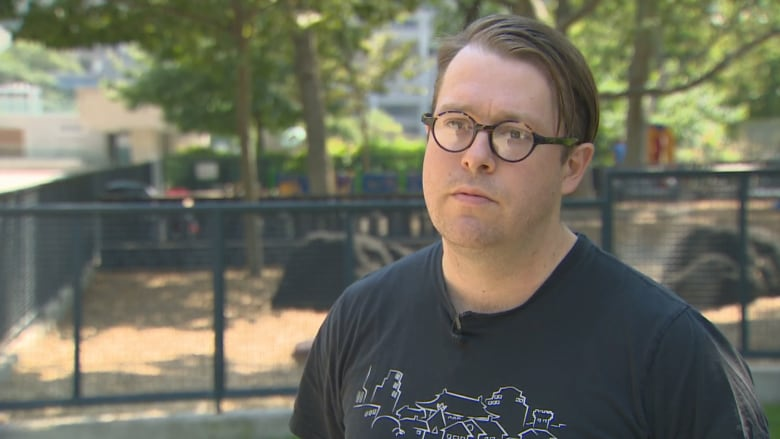 Dent says he's spoken with people on fixed incomes who have considered moving to avoid the charges, and pointed out the risk of heat exhaustion when tenants think they can't afford to cool their units. "People die due to heat exposure. It's a serious issue."